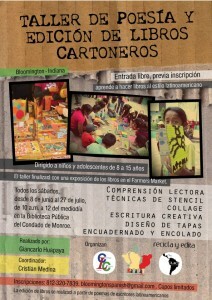 Learn about Latin American poetry and make your own cardboard book from recycled materials. The workshop will include reading poems from Latin American authors, creative writing, cover design, illustration, and book binding. Workshop led by poet and editor Giancarlo Huapaya and coordinated by Cristian Medina.